1. Question: Do I need to be home when my gutters are cleaned? out without further notice, do a great job and leave an invoice. 2. Question: How often should I have my gutters cleaned? Plan". This plan can be discussed with us and includes a discount. 3. Question: How much water lands on my roof in a rain storm? purpose. For this reason you must keep your gutters clean all year round. 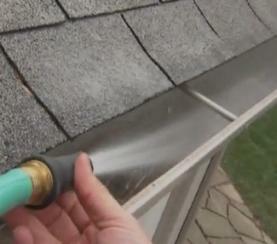 The best and least expensive method to do so is routine gutter cleaning.